It is that time of year where I never seem to be able to find enough time to do all the things I want to do. 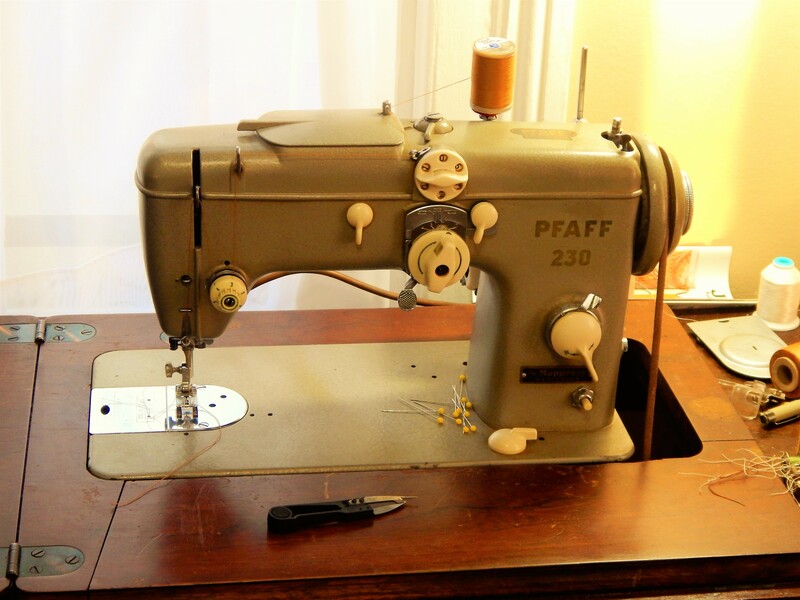 I bought a great new sewing machine, Pfaff 230 and put it in the treadle to try it out. 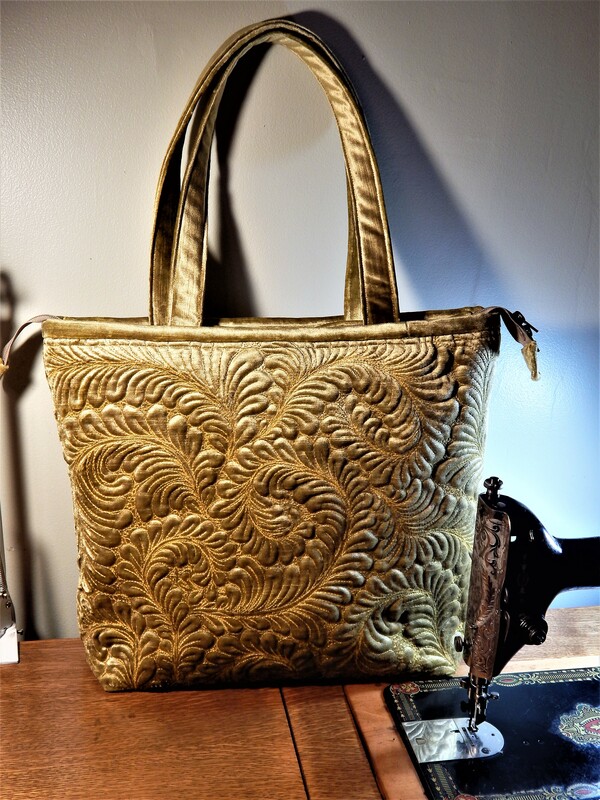 I made a bag with it. 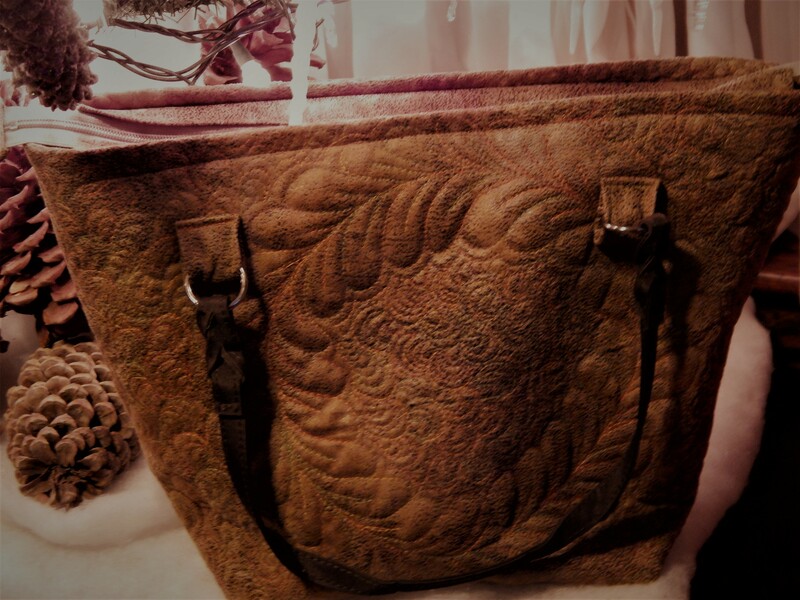 I have 4 more to make and I will be caught up on orders…..then I can get back to some of the many projects I have started. 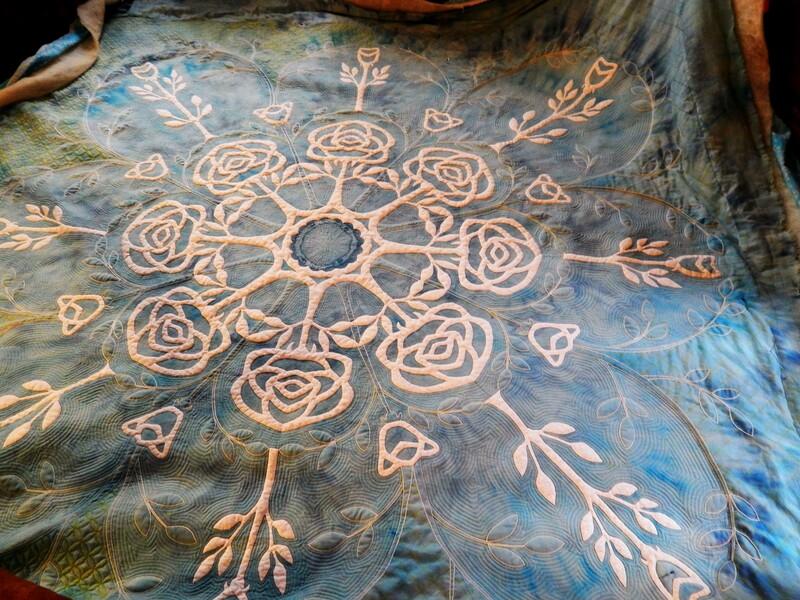 I finished the basic hand quilting on it and got it in the wash to take out all the marking lines and it is hanging to dry now……next I can go back and do the filling in quilting like I did in this small section. then I’ll add trapunto and then binding. 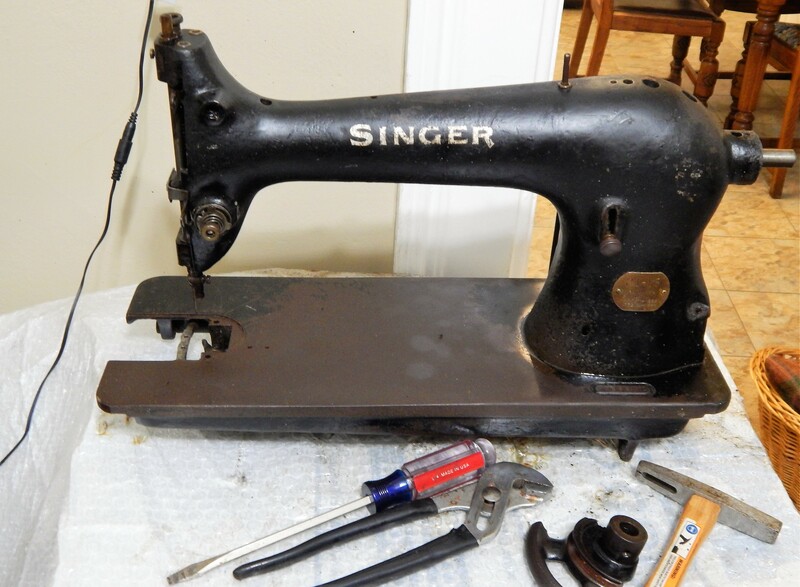 I have an old Singer 31-15 that I plan to get working. I got a treadle base for it today…..I need to do some modifications to that to fit the extra-large machine…..and then do a lot of work on the machine itself. I’ll use it for larger free motion projects because it has so much space , over 10 inches between the needle and the column. Teddy got dressed for Christmas. And it has warmed up again…….it is 35 degrees now. It wont melt all the snow but it should make for safer holiday travel. 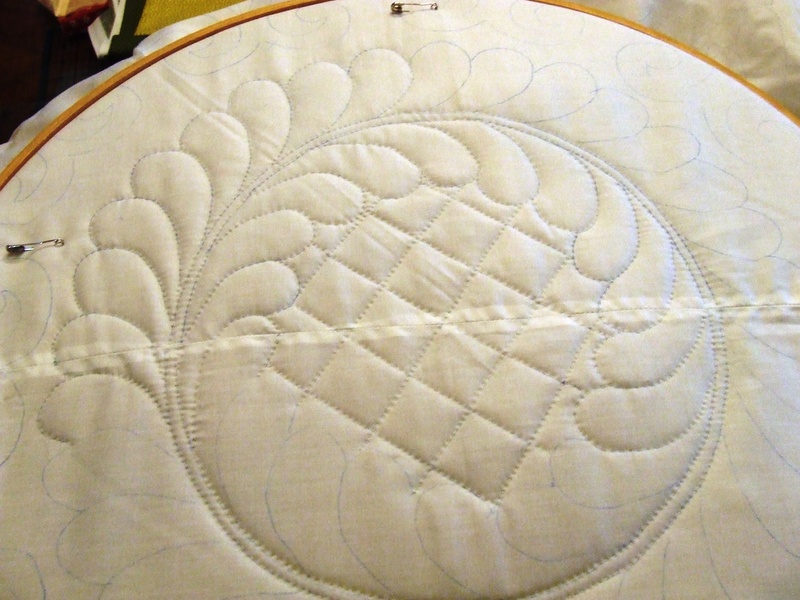 This entry was posted in Quilts and tagged free motion quilting, hand quilting, pfaff 230, Quilting, Quilts. Merry Christmas Tim and Teddy! Amazing as always! Maybe you’ll get some more old machines for Christmas! Have to keep busy! I’m convinced you don’t sleep! I hope you and Teddy have a Merry Christmas. What kind of dog is Teddy…I think I’ve fallen in love with him! Teddy is so adorable. Look at that face! Another wonderful project (s) ! Teddy’s looking very handsome! Hope you get all your tasks done before the holiday, have a great Christmas and New Year. ❤ thank……and to you too! Merry Christmas, Tim. Your creativity is boundless and inspiring. Ear rubs to dapper Teddy! You are such an inspiration! 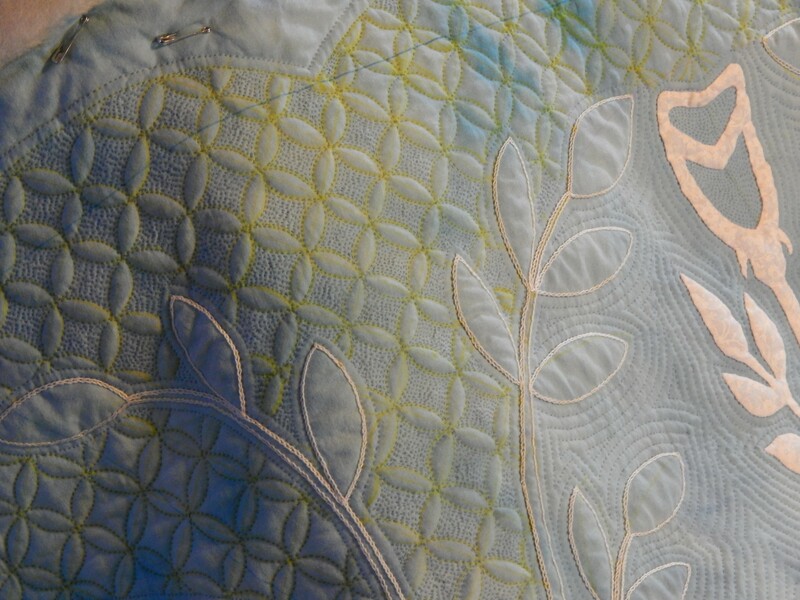 I will work harder this year to stay on track with my quilting projects. Music (director of a handbell choir and a church vocal choir) sometimes pulls me away. Right now I’m doing end of year financial “stuff” and my husband just told me I should have been a singing lawyer. Arrrrrrgh! No way! You and Teddy have a wonderful Christmas! Have a blessed Christmas Tim! Love the bags and seeing the machines. Thanks Tim for sharing your amazing talent with us. I have found your projects truly inspiring. They have given me the boost I definitely needed. Have a wonderful Christmas 🎄. 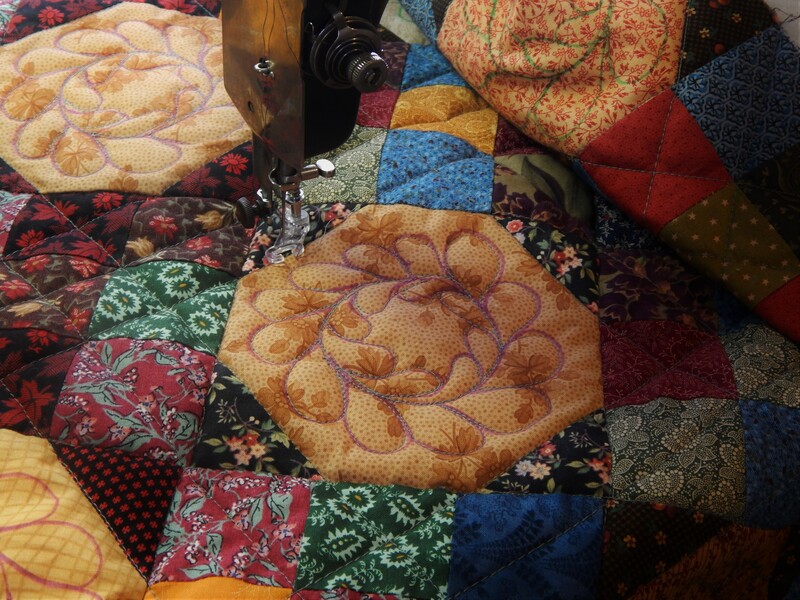 Tim, I am amazed at your prowess with a treadle machine. I had one and just could not get the hang of treadling. Merry Christmas. Wishing you all the best. Warmed up to 35?! that sounds still like brrr to me. :) Merry Christmas,to you and Teddy!! Merry Christmas Tim. 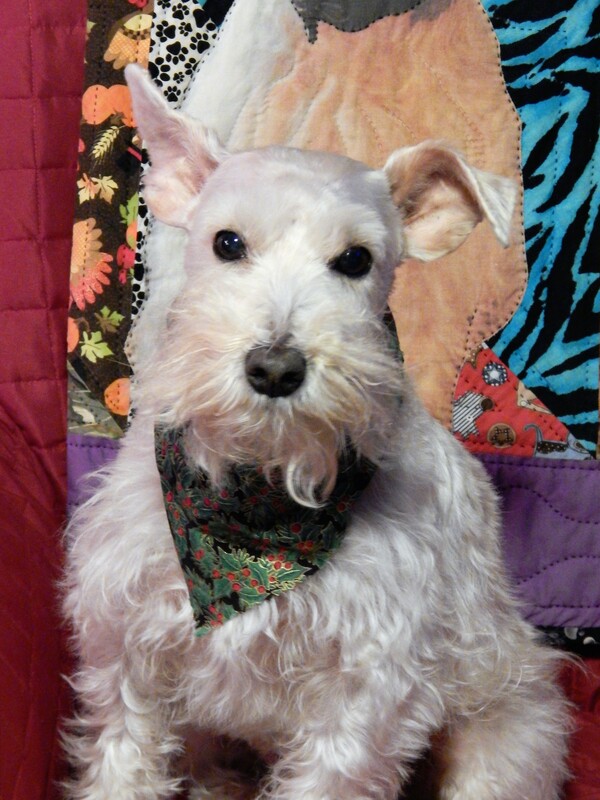 Teddy is looking very dashing in his Christmas bandana. Wishing you all the best for the Ne Year. It’s 35 degrees in Sydney Australia as well! But ours is centigrade to you Fahrenheit! Merry Christmas and thanks for a wonderful year of posting. Hugs to Teddy. I thought when I retired I would get all my Christmas preparations taken care of ahead of time, and could just sit back and relax the week before Christmas….I retired five years ago, and that hasn’t happened yet!! Seems like as long as there is time remaining, there are tasks that keep popping up….but you know what…the important things always get done…so all is good!! I wish you and Teddy a Happy New Year as well…looking forward to more great quilts and garden pictures in 2017!! thank you! have a relaxed and wonderful holiday season! Teddy looks dashing in his Christmas attire. 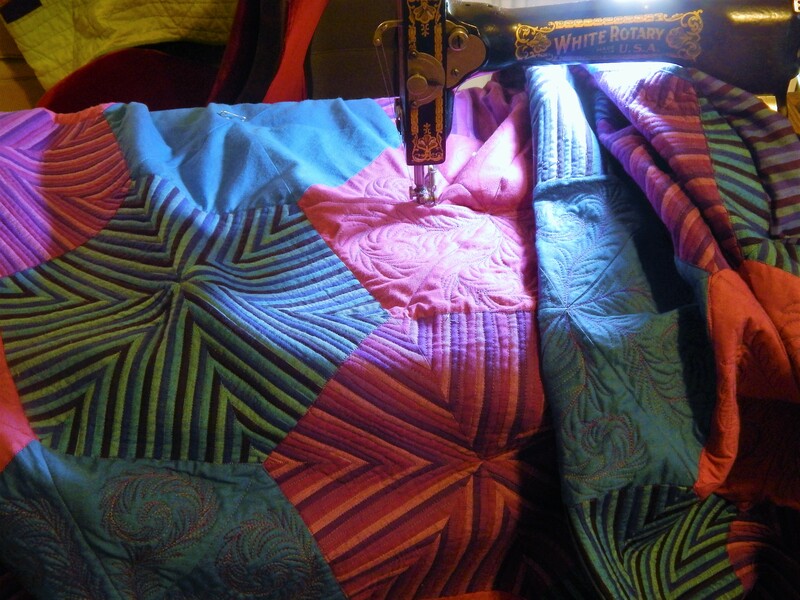 Ten inches of quilting space. . .how awesome! You always amaze me with your varied projects!!!! 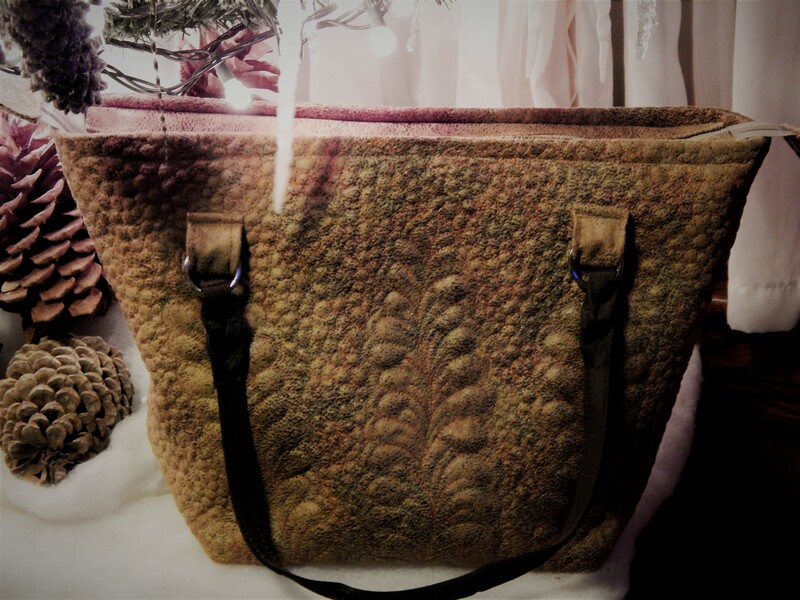 Wonderful holiday post — I can’t decide which I love the most — your new Pfaff, your beautiful quilted bag, or the adorable Christmas photo of Teddy. Hope you and Teddy have a wonderful holiday. Merry Christmas from Belgium,in the rain. Best wishes for a lovely happy xmas and a truly well-deserved good year ahead to Teddy and to you, dear Tim, from sunny (!) England. Merry Christmas to you and Teddy, Tim! You are an amazing, creative person–such an inspiration! Blessings in 2017! Merry Christmas! I thoroughly enjoy your blog and I am looking forward to next year’s. 10 inches of space sounds NICE. Your denim bags are awesome! Actually, all you do is awesome! Thanks for taking the time to share! Merry Christmas to you and Teddy! Merry Christmas and Happy New Year! Looks like another great find! Awesome cabinet. Love my bag by the way. I wonder what it would cost to ship that cabinet and machine?…hey Teddy!